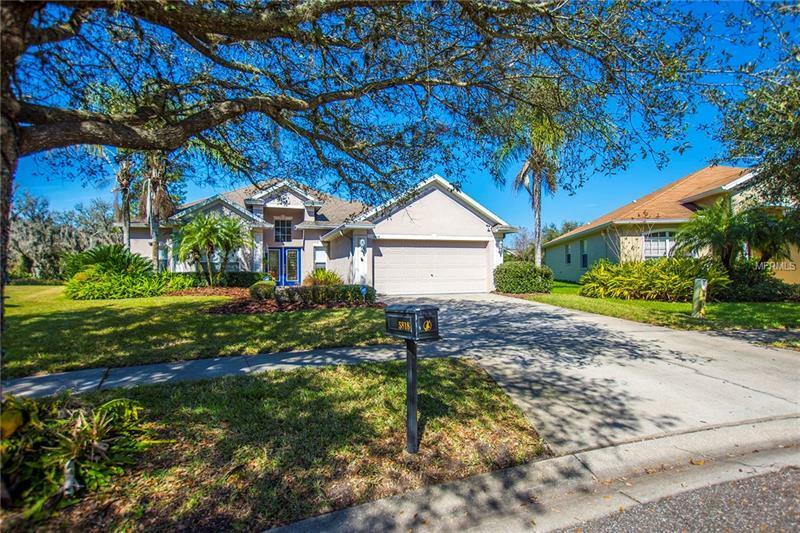 Looking for your home to be located in the prestigious widely known and beautiful Fishhawk Ranch with best rated all grade schools in the state? Don't look any further and come view this immaculate and gorgeous 4 bedrooms plus bonus/den with 2 baths and over 2300 sqft Pool home sitting on a huge pie shape lot facing both conservation and pond views with home being set back on the lot it provides complete privacy in the rear. Make your way thru the double leaded glass front door open floor plan concept to foyer with 13ft ceilings architectural details..art niches rounded corners arches & unique door headers. The combination formal rooms are accented with columns w/the living room offering cathedral ceiling & the dining room w/double tray ceiling! All in 20x20 ceramic tile on diagonal. The family room triple slider to the lanai with incredible views! The oversized and updated kitchen features large island with recessed sink and upgrade faucets 42" hardwood cabinets topped with dentin crown granite counter tops stainless steel appliances and walk-in pantry! The master suite offers double slider & attached bath accented with columns and oversized stand alone tub separate shower with bench & dual sinks! Volume ceilings large Master suite upgraded carpet/pad all bedrooms. Upgraded master shower vanity mirrors lighting faucets master tub & 2nd Bathroom. Huge salt water & heated POOL pavered area w/pergola. Freshly mulched. Amenities galore! Nature Trails Fitness Centers 5+ Comm Pools!